Valentines Day is loved by many... it's about romance - what's sweeter than that. Also dreaded or quickly dismissed by others... a made up holiday by greeting card manufacturers and retailers? Forever dissecting names, and having no idea what I would find, I analyzed the impression and energy in the numbers connected to Valentines Day. See what I learned about the history and numerology of this romantic winter date (pun intended). In the 3rd century, Roman emperor Claudius II would not allow Christians to be married. Saint Valentine ignored this edict and married them anyway. There were probably a few county clerks who refused to hand out marriage licenses, but that didn’t stop the lovers. Today, we see similar acts of defiance and are grateful for Saint Valentine’s example. Love is love and always worthy of celebration and joy, grinches and grouches be damned. Later, during the 14th century when courtly love was all the fashion, February 14 was celebrated by giving a lover flowers or chocolates and sending each other the little love notes we call valentines. This year we will spend almost 20 billion dollars for flowers, sweets, and greeting cards. Using the World Numerology App’s Business Name Advisor, I analyzed the word Valentine. Here’s what numerology has to say about this debated date. With the 3 as the driving force behind Valentine, it promotes optimism, inspiration, and enthusiasm. This influence feels cheerful, outgoing, and charming; it conveys self-expression and skillful communication. 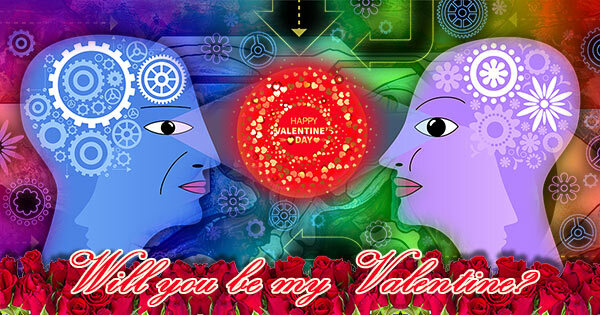 The upbeat energy of Valentine promotes creativity and empowers all artistic endeavors. The name Valentine attracts just about everyone. It carries great public relations and communication skills, and an innate ability to charm the most cynical. The vowels in Valentine add a sense of peace and harmony to the name's main impression; they produce a feeling of comfort, security, and refinement. The 2 adds sensitivity, romance, and an appreciation of beauty. It makes Valentine feel gentler and more harmonious. The consonants in Valentine add dynamic but controlled energy to the name's main impression. They give a sense of clear direction, a carefully guided force, and a feeling of purpose. They convey efficiency, courage, and effort, and emanate dignity and moral strength. The consonants lend a creative and original pioneering spirit. This name might feel somewhat aggressive and unreceptive, which could affect overly sensitive people. Others will feel it lacks focus and discipline, even seems flighty and unstable. Writing/Poetry, Media/Communication, Counseling/Therapy, Music/Dance/Acting, Advertising, Retail, Education, Travel, Environment/Recycling, Visual Arts/Photography, Art/Antiques, Public Relations/Marketing, Architecture, Mechanical/Automotive. I can’t say I’m on board with spending $20 billion dollars on romance merchandise – but true love is priceless and always worth the effort. Or order a Relationship Compatibility Profile and Forecast report in PDF format - delivered within 24 hours.